Jessica has written so much about color therapy that I thought it would be fun to start sharing some of the colors that inspire me or just make me happy. You may see fabric, nature, decor. Who knows? You may see a stack of my Fiestaware dishes if they happen to come out of the dishwasher in a particularly pleasing array. So here we go with Color Therapy Thursday. Maybe every Thursday, maybe not. We'll see how the inspiration hits. Why start with yellow, you ask? It's such a sunny cheery color. But basically I picked it because of a certain purchase we made last night. So now, in no particular order, I introduce yellow. 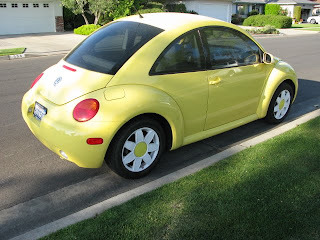 What could be cuter than a yellow VW with daisy wheels? Probably not everyone would want one of these. Mark always said he would never drive a car that comes equipped with a flower vase. But for Jessica, it is the perfect vehicle. 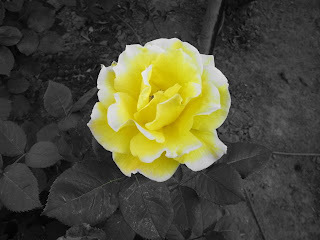 One of the first yellow roses to bloom this year in our rose garden, Midas Gold. Want a cheery way to start your day? Just set your coffee cup on one of these. And here it is. The purchase you have been waiting to see, right? The Cindy Lou, the newest member of our nonmotorized fleet at Lakeview Cottages. It's probably worth mentioning that this is the first time I have ever been in a kayak and I feel pretty safe maneuvering on the grass. The big appeal was really to have something in our fleet with my name on it. Hmmm. 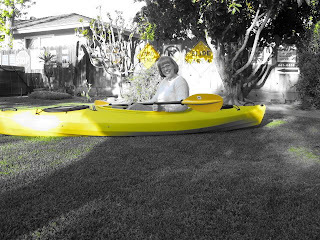 I guess I just was feeling a wee bit envious when Sue got the cutest red kayak named it the Susie Q. We'll see how I feel about it when I am out on the open sea, or the lake as the case may be. So come up to Lakeview Cottages and take her for a spin. Luv the Cindy Lou! My yellow yesterday was bunches of happy daffodils all standing at attention on a 60 degree and sunny day! I kind of go color ga-ga when I see a bunch of KitchenAid stand mixers all lined up next to each other. I want the red! No, the pink! No, the orange! We have a royal blue one, but sometimes wish it had a partner. I LOVE this plate at the top right of your page! Ok...while I dont really like yellow (I know, my car is yellow...) this stuff actually evokes feelings of happiness. Though I think that Aaron's right, McDonalds uses red and yellow because you come in hungry but then you eat fast and leave. Note to Aaron: Does your comment mean that there was too much yellow in this post and now you are annoyed or angry? Just checking.